If you consistently miss putts to the left or right, there could be a simple fix to help you sink more putts. The most likely culprit is alignment. If you’re aimed a bit too far right or left, you’ll consistently miss left or right even if you stroke the perfect putt. You can try this drill either on the practice putting green or in your living room. On the putting green, find a straight putt (no break) and line up the rods or the shafts of the two clubs such that they form a tunnel that goes straight into the hole at a width sufficient to fit your putter in between them and take a putting stroke. Now place a ball in between the two rods or clubs and stroke the putt. If you’re lined up right, the putt should roll straight into the hole. If the alignment feels a bit odd – like you’re aimed too far left or right, then it’s likely your alignment was a bit off and this drill should correct your alignment and you should hole more putts. To do this drill in your living room, just find something about the size of the hole, like a cup. Now set the rods or clubs up as described above and stroke the putt. If it hits the cup, consider it good. Remember, the point of the drill is to make sure you are aligned properly. Practice this drill a few times to get the feel of being properly aligned and then take it to the course and sink more putts. This drill also promotes a putting stroke that doesn’t cut across the ball (from outside to in – left to right for a right-handed putter) which could cause you to pull the putt and miss left. 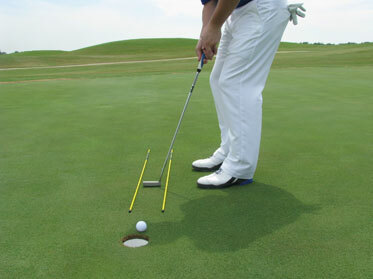 Or to stroke the putt from inside to out which could result in a pushed putt that misses to the right side of the hole. If you still consistently miss putts left or right, then it could be that your putter head is not square at impact. Even if you are aligned properly and put a good stroke on your putt, you could miss left if your putter face is closed or right if your putter face is open. Of course, there’s a good chance your putt will hit the alignment rods if you’re putter face is opened or closed at impact. It shouldn’t take long for this simple drill to help you hole more putts.